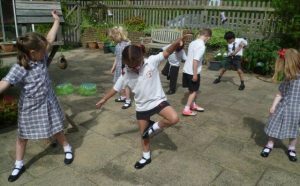 We have been learning about the sun and how shadows come about …. having traced the pattern that shadows made throughout the day and compared their length and position, we all agreed that the pattern looked like a clock face. We went on to record our own pictures of ourselves with a shadow – with quite interesting results! In art we made beautiful leaf rubbings with wax crayons. This helped us remember that the veins of a leaf carry food and water throughout the leaf and also offer it support. We worked hard in our swimming and PE lessons in the hope of making our Triathlon attempts even better!